UV Coating gives your images a more vibrant color and also helps protect your postcard. UV is our most popular choice but you cannot write on UV coating. You can however place a label. • Images are not included in design services. You will need to send over the images required, or we can help you purchase the images. • Print ready images stay on file here for re-order but you will receive a preview to keep for your records. Bundling can add 1 additional business day to your order. • We will use a paper band and bundle it to EDDM requirements. • You will still need to place a EDDM label onto the stacks. We review your EDDM postcard design to be sure it is setup to USPS EDDM standards. We will add your postal Indicia for you if you select yes at no cost. We will send you a preview before going to print for your review. This EDDM® Postcard at 8″x10″ is almost the size of a standard piece of office paper. This is an ideal size if your message needs to include lots of images or if you need more room to explain your best promotional offer. 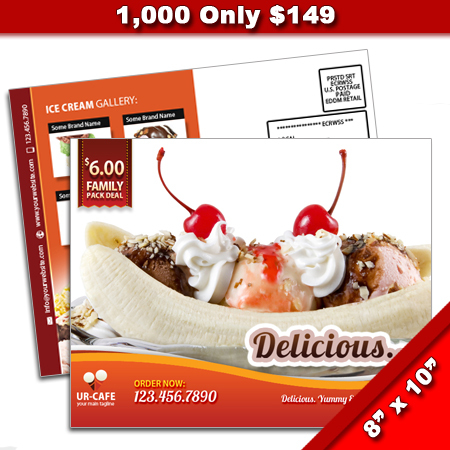 This is also an ideal size if your Every Door Direct Mail® postcard includes many valuable coupons. With the size of this flyer you should have no problem getting your message across. Every Door Direct Mail - Retail®, and EDDM PLUS™ are trademarks of the United States Postal Service®. EDDMDiscounts.com Businesscardsflyersbanners.com is an independent provider of Print Shop services that is not associated, sponsored, or otherwise approved by the United States Postal Service to provide these services.